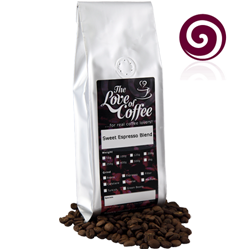 Flavour: A lovely smooth espresso coffee with a sweet and mellow liquor. A lovely smooth espresso coffee, roasted slightly lighter to decrease the bitterness. With a majority of Monsoon Malabar in the blend it has a sweet and mellow liquor – we have added some Santos to produce a lasting body. Ideal for the “English” espresso drinker. Have used this great company on several occasions but this time they surpassed them selves - ordered one day received the next!! Thanks again. Consistently great quality and fast delivery. Brilliant service with an excellent range of coffees to choose from. Onto which outstanding quality of coffee. Ordered on a whim a while ago and now exclusively order my coffee here. Well deserved 5 stars. Excellent coffee and excellent choice. So much fun trying them all out. Amazing to think there are so many differences between them. Great service too. Finally found beans suitable. Sometimes slightly bitter taste but think this mainly coming to terms with my new sage machine! Excellent service. Fast delivery and great products. Once again an excellent service from the love of coffee. Fast delivery and fantastic coffee. We will be back soon for a refill. Thanks again. After spending £1,500 on a coffee machine I naturally wanted freshly roasted beans to get the best results. Based upon past experience, 'The Love of Coffee' meets my criteria in terms of product range and service. A very special thank you for your help and excellent customer service, and also for the very nice coffee that you sell.